Those readers interested in Napoleon will want to give this slim volume a pass—this is a book for academics interested specifically in leadership. It is not a history about the charismatic emperor or of his leadership skills, but is really more about leadership as a subject in itself. 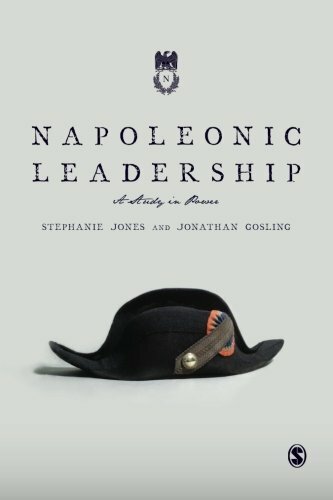 Napoleonic Leadership is written by two authors eminently qualified on the topic at hand: Stephanie Jones is Associate professor of Organizational Behavior at Maastricht School of Management, and Johnathan Gosling is a professor of Leadership at the Centre for Leadership Studies, University of Exeter. This volume is divided into eight thematic chapters that examine various approaches to leadership used by Napoleon before and during the French Revolutionary and Napoleonic Wars. Readers will examine the theories of patronage, merit, charisma, coup d’état, manipulation, fear, election, and inheritance. The leadership styles are clearly explained and are straightforwardly examined; they could even be looked up and understood by their definitions in a dictionary, but Jones and Gosling have gone a step further in giving greater context in showing how these styles really work in a cogent and coherent narrative. Names, dates, historical facts, and context are provided in just enough detail to get across the information without bogging down the reader. The writing style is simple and straightforward, if a little plodding in rhythm, and easy for most undergraduate students to grasp, as well as any lay-readers just interested in leadership, but will ultimately bore general readers. This is a great volume for students in a leadership or MBA program for use in a classroom. The bibliography, which includes more suggestions for reading about Napoleon as well as books for reading about leadership, is very useful and will be a huge drawing point to most academic libraries and scholars. There are insets of reflections and style of the various leadership approaches in each chapters and at the end are questions for consideration readers may choose to reflect on. These questions at the end make this book more valuable and ought to be required reading for anyone interested in learning more about leadership and possibly achieving a boardroom or administrative position. It would have been nice if the authors provided a website to explain the purpose behind the questions they asked: Helping readers use the questions and their answers to strengthen their knowledge would be more useful than just asking questions. Michelle Martinez is a research librarian and freelance writer, editor, and book reviewer. Her articles on science, technology, and sociological topics have appeared in numerous publications. Her book reviews appear in publications as diverse as Library Journal and Feminist Collections.